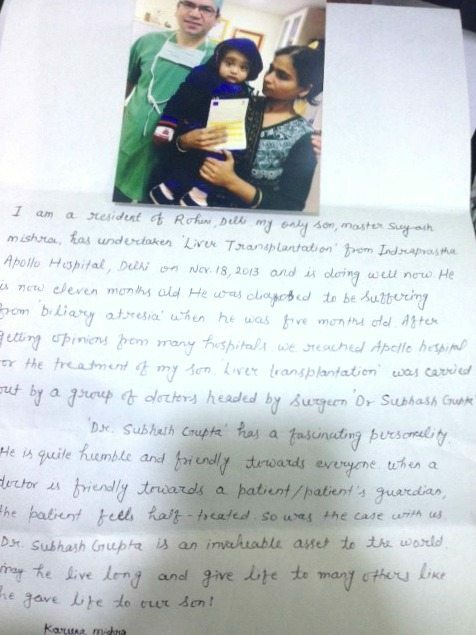 Suyash Mishra who is the one and only son of Mrs & Mr. Harsh Narayan Mishra has undergone a “Living Donor Liver Transplant ” at CLBS in Indraprastha Apollo Hospital by Dr. Subash Gupta and his team on November,18,2013. He was diagnosed with “Biliary Atresia”. After visiting in different hospitals across Delhi, they visited CLBS and discussed their issues with Dr. Subash Gupta. Finally, it was in this hospital that their baby successfully underwent Liver Transplantation. The team received the following letter thanking them for this second chance at life for their baby.